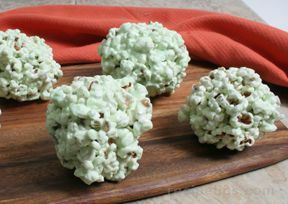 Sweet and chewy traditional popcorn balls. 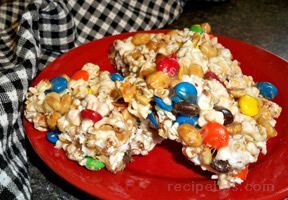 Pop 1 1/2 cups of popcorn (this should make 8 to 10 cups of popped corn), sort out any unpopped kernels, and place the popcorn in a large bowl. Place sugar, whipping cream, syrup and butter in a saucepan and cook until a candy thermometer reads the soft ball stage. If you don't have a candy thermometer, you can use a spoon and drop a small amount of the syrup into a bowl of water, if the syrup turns into a soft pliable ball, it is ready. 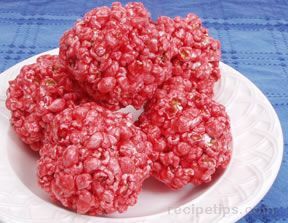 Pour mixture over the popcorn, mix and shape into balls. 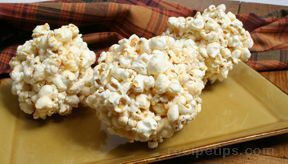 "Absolutly the BEST Chewy Popcorn Balls recipe I've come across! And I tried at least half a dozen last year before I found this one. I made tons and everyone loved them. I lost the recipe and luckily found it again through a search engine! One correction to make; you need to use about 8-10 cups of popped popcorn, but I figured the 1 1/2 cups was a typo. Thanks for the great recipe!"